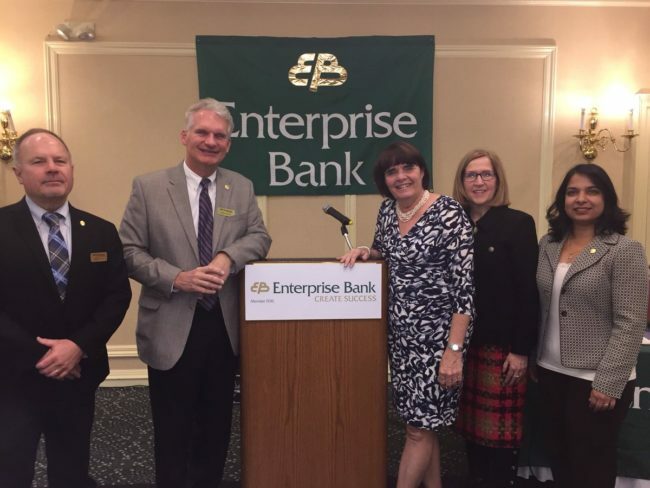 Earlier this month I had the pleasure of attending a presentation entitled “Protecting Elders from Financial Theft & Exploitation” which was sponsored by Enterprise Bank. Middlesex District Attorney Marian T. Ryan and Elder Law Attorney Martha Howe were the main speakers and delivered some chilling real-life examples of abuse that are happening throughout our communities every day. Some common examples are identity theft, fake lottery winnings, performing unnecessary home improvements and the “Grandparents” scam (requesting money to be sent to get a grandchild out of jail). These scams can cost victims thousands of dollars and in some cases drain entire life savings. The financial losses are obvious but in many cases the victims also experience depression, loss of trust in others, lack of security and feelings of remorse and worthlessness. Many victims never report the incidents because of embarrassment and shame. It’s critical to report any suspicious activities to law enforcement as soon as possible. Law enforcement works closely with Banking Institutions to investigate these cases. If this has happened to you it’s important to know that you’re not alone and there are resources available to help. For more details you can view D.A. Marian T. Ryan’s talk here.